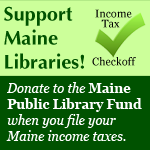 Vassalboro Public Library : Book & Bake Sale and Silent Auction! Book & Bake Sale and Silent Auction! The 58th Annual Book & Bake Sale will be on Saturday, September 9th from 9 am to 3 pm at the East Vassalboro Grange. On Sunday, September 10th we will have the "Buck A Bag" Sale from 10 am to 1 pm. The 9th Annual Silent Auction will be moved to the Grange and bids will be accepted until 2:30 PM on Saturday We have over 80 wonderful items to bid on! The list is below, with the approximate value of each item! We hope you will come check out the bargain books, sweet treats and our auction items! Reminder: The Library will be CLOSED on Saturday, September 9th during our event! We appreciate your help & support over the years!